ACCESS CONTROL what is it? Nowadays you often hear the term access control used. All it really means is just who is allowed through an entryway or into a certain part of a building. If you think about it, access control is everywhere in Atlanta, GA and in every other part of the world. We actually experience it often in our daily lives.Every time you see a security guard or a bouncer you are seeing access control at work. The security guard usually decides who gains access, who stays, and who must leave. Another example is a metal turnstile or even a metal detector at an airport.Any person or thing that restricts or controls access to a certain area is a form of access control. Try going on a tour of a museum or of the White House for that matter and you will see a access control at work! You can also see access control at universities, hospitals, movie theaters, shopping centers and in both residential and business locations all over town. Even something as simple as a sign that says Authorized Personnel Only or Valet Parking is a form of access control. Is Access Control Really Needed? Access control IS needed and has been used for thousands of years to keep order and better security. Here in Atlanta, GA we have restaurants, shopping locations and educational institutions where ticket holders, security personnel, VIP guests, and other special customers are allowed certain access and others are not. Every town in the country has similar situations. Try going to any sporting event and you can always spot where the high ticket seats and boxes are located. They are making use of access control! Other applications include public school lock downs and workplace violence where certain sections of a building are closed off. Here are some benefits of access control. An established access control system allows only authorized people access to certain parts of a building or location. At the same time, it blocks access to unauthorized individuals or staff members. It also increases security in residential, educational, institutional, and commercial locations. This provides additional protection, peace of mind, and safety for residents, employees and customers, as well. Sure, you can always lock a door, and that has its benefits, but for more advanced access control an electronic system allows for more advanced controlled access as well as visual and audio surveillance of an area. Take for example the remote monitoring and even visitor identification at your local courthouse, hospital,high end restaurant or casino and watch how they control the flow of the public and paying guests. 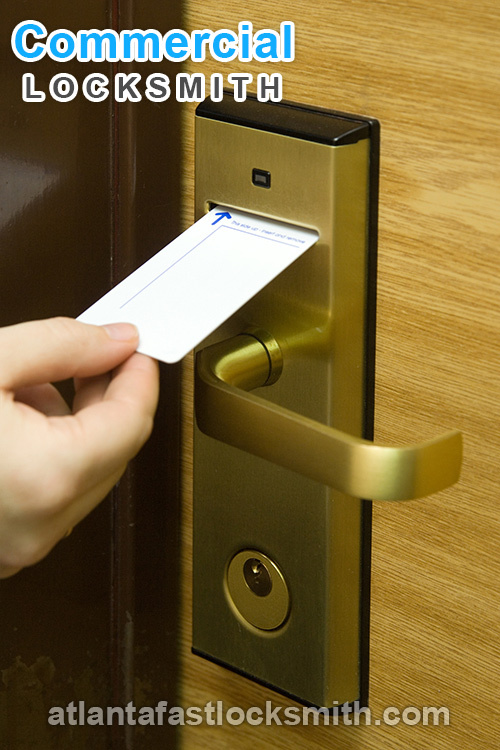 Here at Atlanta Fast Locksmith we offer dozens of forms of access control. We have services and products to fit every budget and for every need.Our service is perfect for both residential and commercial applications. We invite you to call and speak to any of our helpful locksmith professionals and see how access control can benefit you and make your life safer and better protected. One of the most simple and economical ways to utilize access control is to make use of a keypad. Simply punch in a number or combination sequence and you can gain access to a designated area. It’s fast, it’s easy, and it’s practical. The keypad can even identify which persons are entering which parts of the building and at what time. One problem though, user codes and combinations can be given to unauthorized persons so it’s always a good idea to match a keypad with video surveillance for more accurate identification and control. Keypads are most often used in hotels, high-rise condo units, and automotive vehicles. Additionally, keypads can be programmed so that if the wrong combination is used an alarm will sound. By using these alarms unauthorized users are discouraged from trying one code after another in the hopes that they will discover the right combination and be able to gain access. These are also call stripe cards and are often used in call centers, credit card companies and banks. They are very economical to make and to use. One drawback though; they should be avoided whenever high security access control is required as these cards can be easily and cheaply duplicated with the right equipment. FOB keys are used quite often. They are most often made in to a plastic card that can be attached to a key ring. The chip or electronic device is on the inside of the card itself. The user simply holds the card to a reader device which gives access th the user when it is recognized. These are often used as employee badges. Biometric readers are one of the most reliable and advanced methods of access control. Here at Atlanta Fast Locksmith our biometric entry systems offer this method of access control and a great many others. These biometric readers are very convenient for users as they don’t have to carry badges, keys or any form of credentials. They simply use their fingerprints to gain access! These are also known as fingerprint locks and are now used in applications like smart phones and laptops. Other, more advanced biometric access control includes retina scanners, voice recognition, signature recognition, and hand identification. As you can see access control in all of its many forms is very common and its use is widespread not only here in Atlanta, GA but in other places, too. Other access control systems include electronic keys,residential keypads, remote controls, proximity readers, and other similar types. Anytime you wish to have better control over your building, property, or inventory you should consider using access control. Humans have used keys for thousands of years and still do today, however their use is limited as they can be lent out to others or easily copied. One of the problems with keys is that you cannot track their usage. For additional control and security you should consider using access control methods. 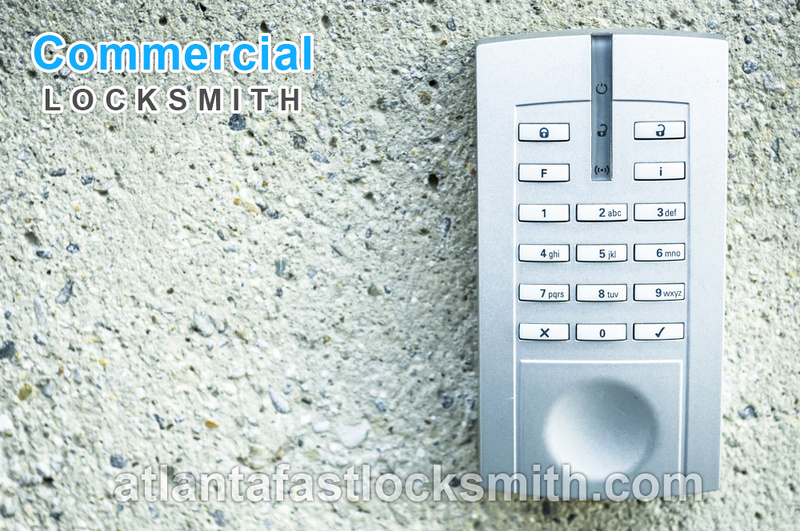 Here at Atlanta Fast Locksmith we make access control available to any customer that needs or wants it. We work with small to practically unlimited budgets. 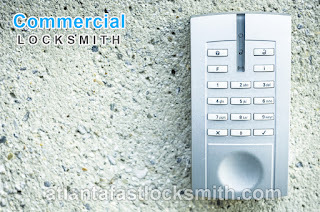 If you wish to familiarize yourself with more of its applications and how it can help your residential or commercial security we invite you to call our Atlanta, GA locksmiths and get free details along with helpful, no-cost price quotes. via Blogger ACCESS CONTROL – what is it?